My family’s conversations are filled with quotes from favorite movies. Star Trek, Star Wars, The Princess Bride, and others are filled with very quotable quotes. If we see a beautiful full moon, one of us will say, “Wow! Look at that moon!” Another will quip “That’s no moon…that’s a spacestation!” (Star Wars) Or if one of us says “This plant is dead.” Another will say, “It’s not dead. It’s only mostly dead. I’ve seen worse.” (Princess Bride). We do this all the time. One of our very, very favorite TV programs is a science fiction series called Firefly that originally aired in 2002-2003. It was created by Joss Whedon and starred Nathan Fillion. We have the whole series on DVD and we watch it often. Nathan Fillion now stars in the TV series Castle, but he loved Firefly. Castle is filled with Firefly references and occasionally Firefly cast members guest star in Castle. We love it! Anyway, Firefly is filled with wonderful quotable quotes. I’ve been thinking of one quote in particular this week because it pretty much described last week. EJ found a youtube video of the scene for me. It is worth watching. The week started out quite well. JJ started college last Monday. He’s had a few days of feeling overwhelmed, which I told him to expect, but mostly he is enjoying it. The vet had given us pills for giardia for all the cats, in case that infection was causing diarrhea. Not all the cats have diarrhea, but he wanted to eliminate that as a cause. We had to give eight cats a quarter of a pill morning and night. EJ and I worked together. As I always do when I have to give the cats medication, I caught and wrapped each cat in a towel so he/she couldn’t get away, scratch, or bite, and held him/her while EJ administered the pill. The cats HATED the taste, and they did all they could to resist. I’ve never seen them fight and squirm so hard to get away. I got pretty good at holding the squirming cats so they couldn’t get away. EJ got pretty good at giving the pills to the cats, but it still was an effort to get them to swallow them. Some of them held the pill in the side of their mouth so they could spit it out later. The pills did not help the diarrhea. EJ said a couple of his co-workers said that their cats had a bad case of diarrhea so they switched to a high quality cat food like “Science Diet” and it cured the diarrhea. So we bought some good cat food and we are trying to see if that works. It is distressing to me that the cats have diarrhea. I did see some non-diarrhea poop in the inside litter box not long ago, so maybe the food is helping. Yafah has worms (we are giving her worm medication) which might be responsible for her diarrhea. However, I also wonder if part of the cats’ problem is stress or environmental. We are still battling fleas. They are not at all as bad as they were several weeks ago, but I occasionally find one or two on me (and that’s one or two too many), and I am trying to get on top of the problem so they don’t get worse. We have to medicate the cats and spray the house in sync so that one does not reinfect the other. In previous years, if I noticed any fleas, I just gave the cats some flea medication, sprayed the house, and then the fleas were gone. This year it hasn’t been like that. I have never, ever, ever had such a problem with fleas. I’ve heard from several sources that this year the fleas have been very, very bad–much worse than normal. I guess the weather has been perfect for their breeding. I am getting exhausted dealing with fleas and diarrhea. Also, the rash I have been struggling with this summer has reappeared. In addition, EJ came home from work and told us that a woman at work who is addicted to serious drugs kept working after she was diagnosed with a contagious virus called MRSA. Everyone who worked in the same plant with this woman has been exposed to it. WebMD says that MRSA is a bacterium that causes infections in different parts of the body. It’s tougher to treat than most strains of staphylococcus aureus — or staph — because it’s resistant to some commonly used antibiotics. MRSA is spread by contact. So, you could get MRSA by touching another person who has it on the skin. Or you could get it by touching objects that have the bacteria on them. The symptoms of MRSA depend on where you’re infected. Most often, it causes mild infections on the skin, like sores or boils. But it can also cause more serious skin infections or infect surgical wounds, the bloodstream, the lungs, or the urinary tract. Though most MRSA infections aren’t serious, some can be life-threatening. Many public health experts are alarmed by the spread of tough strains of MRSA. Because it’s hard to treat, MRSA is sometimes called a “superbug.” MRSA infections are common among people who have weak immune systems. I am concerned for EJ and JJ. EJ is concerned for me because for much of the summer, I was taking Prednisone for my rash. Prednisone weakens the immune system. Tomorrow we will call our doctor to begin the process to test to see if we have the virus. I felt so stressed today that I went out to work in the garden. Gardens are good stress-relievers. First of all, I admired my sunflowers. In late Spring I planted sunflower seeds in various places through the yard. Sunflowers are very cheerful flowers. Some of the sunflowers got knocked down in a storm, but most of them are holding up pretty well. 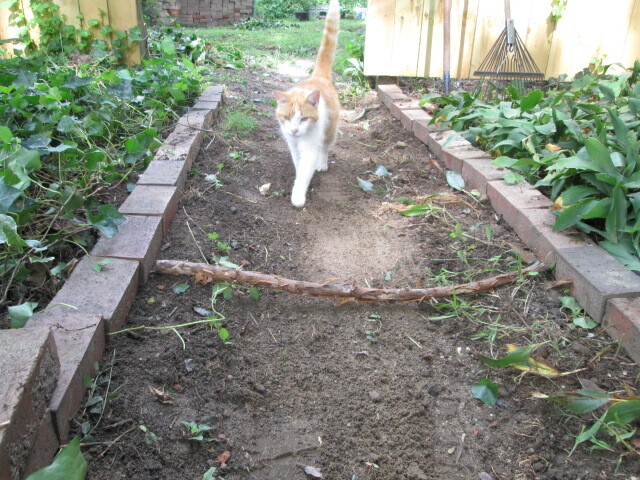 The stick…and my garden cat. Then I headed back to worked on my path. As I crossed the back yard, a large spotted frog LEAPED in fear (I probably nearly stepped on him) and landed on my foot. I screamed, and he went one way and I went another. After I got over being startled, I went back and found him again. He was a pretty frog. I wish I could have taken a picture of him, but by the time I had gotten my camera, he had hidden. After I removed the bricks a few weeks ago, I lined the path with the bricks. However, when I tried to mow the path last week, I discovered that the lawn mower is too wide for the path. So today I found a stick that is just a little wider than the mower, and I used it to help me make the path wide enough. It is primitive but very effective. As you can see, my garden companion, Rikki-Tikki-Tabby, joined me as I worked–as he usually does when I work in the garden. The part of the path that I finished today. I have a lot of vines in my garden. I had to yank up the vines that were in the way so that the bricks would set level. This was a very hard job. I used the hoe and clippers to get the vines out of the way. I had a brilliant idea of mowing the vines to then make it easier to use the hoe. The mower nicely did what I wanted, but I was able to mow just a few feet before it died. I couldn’t get it started again–although I tried–so I went back to yanking up, hoeing, and clipping the vines. 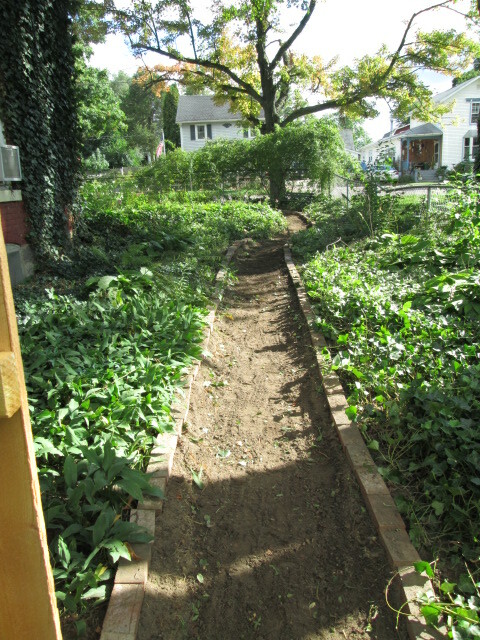 It was so difficult that I had to stop just before I reached my goal of finishing the path along one side of the house. I will work on it again another day. I hope. I was exhausted when I quit for the day, but the garden had helped relieve much of my stress and I was in a more cheerful frame of mind. The day was beautiful. As I said, my week (and summer) sure was interesting. The path looks good. Maybe you can fill it with wood chips or something so the grass won’t grow.